Hi Sarah & Miss Dolly! Hope you guys are well! Sharing some photos please use whatever you like. Our 5 bluebirds have fledged, in the one photo the little guy was ready to leave and he got scolded by Mom and Dad and poked back in the house! It was lucky timing on my part! The next day they did all fledge. Dad is a busy bee! I did not get a shot of all 5 together but he is bringing all 5 up to the house. It’s always a treat when we get to see they have all fledged and doing well!! They have built a 2nd nest already. Dad is doing all of the feeding this year. He is the father of the year! What a job for him! Happy to report your idea of adding the wren house last year has been a success! Although the Wren used the one bluebird house, chickadees used the wren house and the bluebirds used one house! We have not had any aggressive behavior! Everyone was busy doing their own thing! 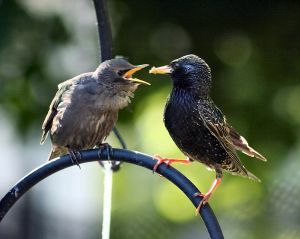 I woke up this morning to the sound of one of the least melodious noises of spring, starling babies at the feeders. European Starlings are not loved by many birdwatchers. 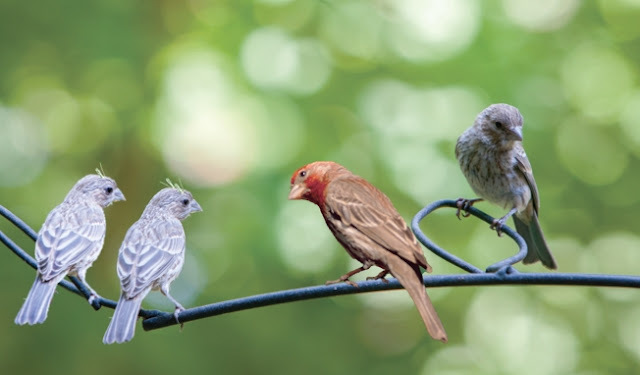 Their territorial aggression, gluttony at backyard bird feeders, and raucous voices make them the most talked about bird in the month of May at our Wild Birds Unlimited store. However, starlings have an interesting history. Imported from England in the late 1800s, one hundred birds were release in New York City as a deliberate plan to exchange plants and animals from one part of the world to another. Scientists estimate that descendants from those original birds now number more than 200 million all across the United States. One reason for their population growth is their relationship with humans. Even though many people don’t like them, they like us. The comfortable perching power lines along the roads, our houses with cozy nesting areas in any available nook or cranny, and the manicured lawns full of yummy bugs give them an opportunity to live in comfortable surroundings. 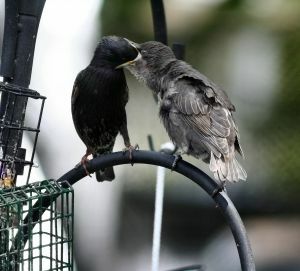 During the breeding season starlings will eat nearly anything, but they focus on insects and other invertebrates when they’re available. Common prey include grasshoppers, beetles, flies, caterpillars, snails, earthworms, millipedes, and spiders obtained from the surface of soil and grass. In winter, starlings tend to eat a more fruits, nuts and berries. Besides their voracious consumption of harmful insects, they are also a food source for many of our native birds and animals. Because they are very abundant during most of the year, the European Starling is an important prey species as food for hawks. And they are a fascinating birds to watch. Though fledglings make loud squawks, older birds can reproduce the sounds of other birds as well as humans and almost any sound they hear. Mated pairs are usually monogamous and are devoted parents. Babies are all brown at first and look larger than the glossy blue/black adults. I watch the parents approach fledglings cautiously to feed them like they are afraid their big baby might snap their head off. As the summer rolls along the babies change their feathers to look like they are wearing a black and white spotted vest and then in the fall they graduate into their full snazzy, black and white spotted suit of feathers. All starlings molt their feathers in the fall. Their new feathers are black with bold white tips, giving the bird “stars”. By spring, these tips have worn away, leaving them iridescent black. 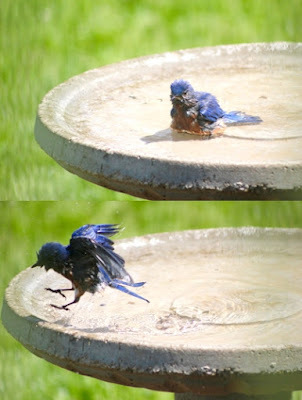 It’s an unusual changing act that scientists’ term “wear molt.” To keep their feathers in tip top shape they bath frequently, often in large numbers. I’ve had several customers describing their enthusiastic washing techniques, leaving the bath empty by the end. But their unusual diet, speech, and wardrobe doesn’t compare to the impressive fall flocks that gather in the thousands to perform graceful synchronized aerial murmuration dances. The swoop and sweep of thousands of European Starlings before they settle down for the night is one of nature's most spectacular sights, and still something of a mystery to birdwatchers. This image is a before and after photo of Beauty the Bald Eagle, who was shot in the beak and received a pioneering, 3D printed prosthetic beak. First recovered in Alaska, Beauty was found badly injured, unable to eat, and fighting for her life. Her top beak had been shot off by a poacher, and she’d been left to die. Raptor biologist Janie Veltkamp brought Beauty to her raptor center, Birds of Prey Northwest in Idaho. To give Beauty a chance at life, Janie led the team of mechanical engineers, veterinarians and dentists, to make a 3D bionic beak that can be used to preen her feathers, drink and eat. Hummingbirds forage for protein packed insects and quick energy from flower nectar. A hummingbird may visit 2,000 flowers in one day in search of nectar. They must eat several times their weight in nectar daily to stay alive. Fill your yard with native flowering plants, vines, shrubs, and trees. 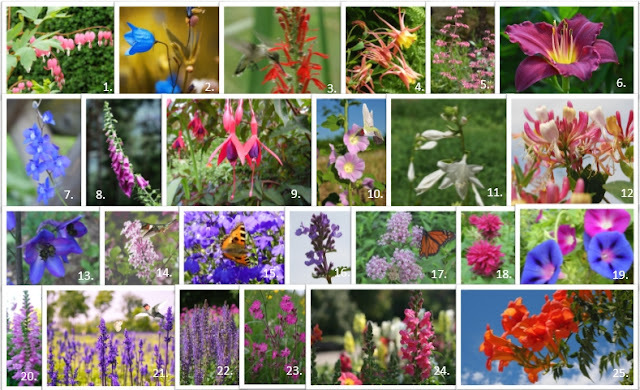 Check out the native plants database. Even one plant in a window box or hanging basket can help. Grow native plants which provide much more nectar than hybrids and exotics. I can't keep up with all the birds coming to the feeders. I'm looking for any advice. You only have to feed as much as you want. 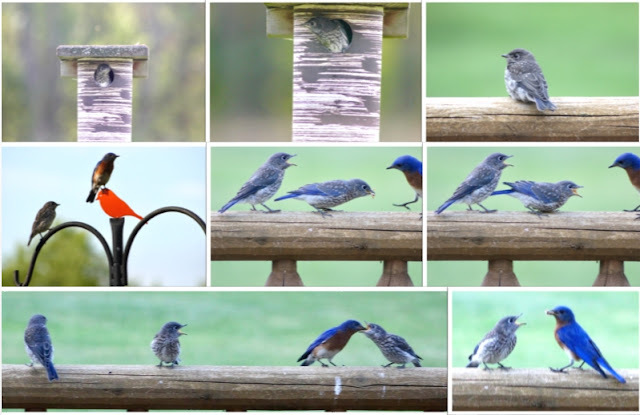 I like to watch all the bird interactions and all the new birds arriving, but you can limit the number of feeders or the amount of food offered to make it more enjoyable and not a chore. After a long migration or harsh winter, birds are hungry and appreciate an easy meal to rebuild their energy. However as a lot more food sources became available, there should be a drop in the numbers of starlings and blackbirds visiting. Thankfully it looks like the cold weather is finally going to leave us for a while. The rains and now the warm weather brings a lot of bugs, a favorite food for many growing families. And vegetarians like the American Goldfinches are also enjoying soft spring leaves as well as a plethora of dandelion and grass seeds. 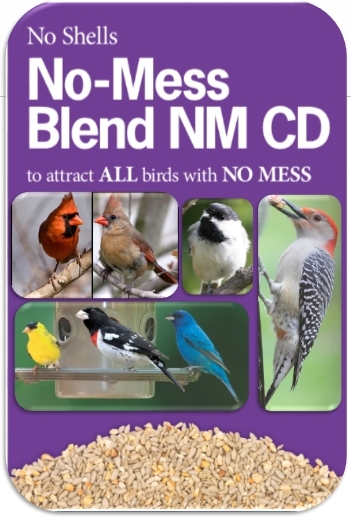 But, don’t forget to keep your feeders clean to keep your birds healthy. And provide an area with a birdbath. 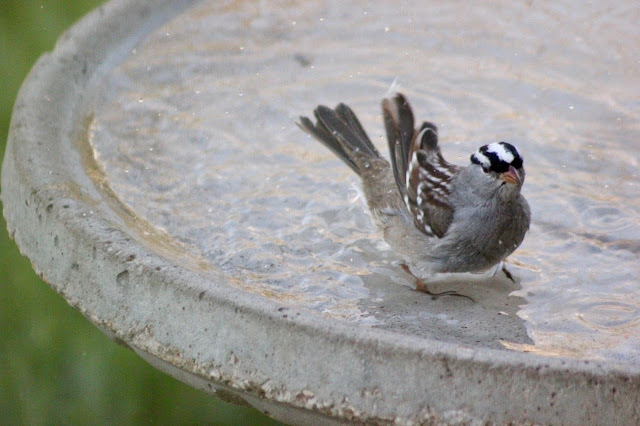 Water is a powerful attraction and will increase the number and variety of birds coming to your yard. In fact parent birds will often bring babies to the bird bath as their first road trip. Jubilee and Munin, Ravens of the Tower of London. The results the Wikimedia Commons picture of the year contest was announced and a pair of ravens clearly took center stage. The intriguing image, seen above, features Jubilee and Munin, two of the Tower of London’s six ravens. Jubilee was hatched in Somerset in 2012 and wears a gold band. He was given to the Queen on her Diamond Jubilee. Munin was hatched in North Uist in 1995 and wears a light green band. She is the oldest raven at the tower. The photo was taken by Wikimedia volunteer Colin. 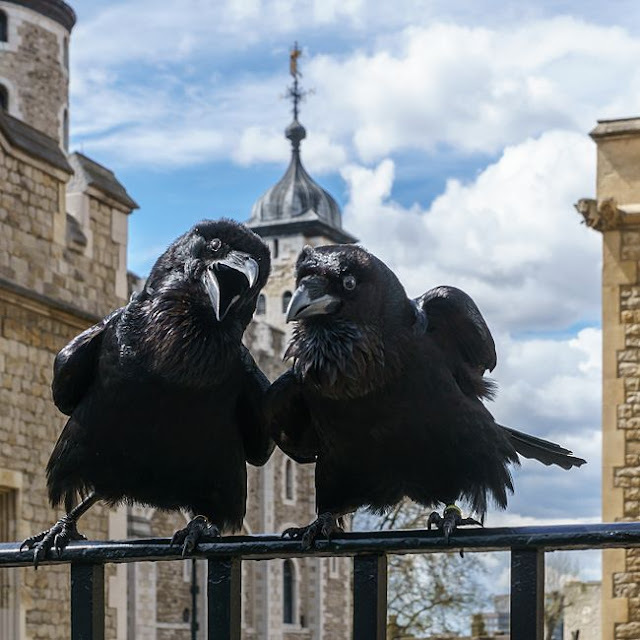 The presence of Ravens is traditionally believed to protect the Crown and the tower; a superstition holds that "if the Tower of London ravens are lost or fly away, the Crown will fall and Britain with it". 1. "A Guide to the Tower Ravens" (PDF). Historic Royal Palaces: Tower of London. Retrieved 9 April 2017. A bird feeder full of fresh seed that your local birds prefer is good for birds and bird watchers alike. But without proper maintenance, it can become harmful. Just like setting up a restaurant, you must provide your customers with a safe and pleasant dining experience. Seed Feeders should be cleaned at least once a month or more often during times of heavy use or wet weather. Disassemble, soak and scrub feeders in a mixture of one part bleach or vinegar to nine parts water with a little soap for at least three minutes. Rinse thoroughly and allow to completely dry before refilling. Hummingbird feeder cleaning should be even more frequent. Wash your hummer feeders at least once a week when it is below 70 degrees and at least twice a week when it is above 70 degrees. Cleaning will help prevent mold and deadly fermentation. Some migrant birds are still on the move. 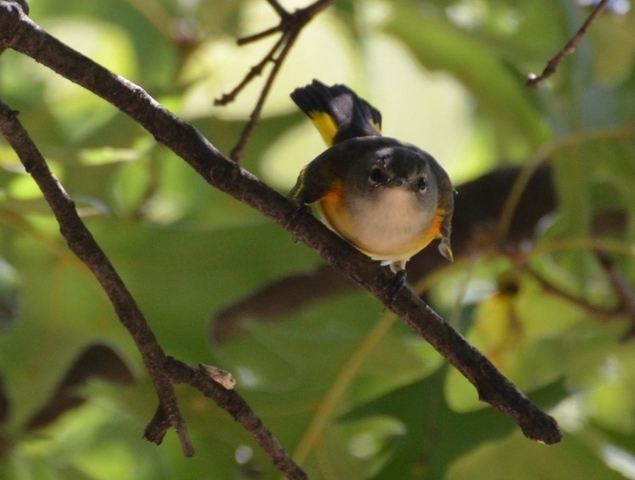 I had an American Redstart female in the viburnum last weekend. She was stunning! A tiny, slim gray warbler with touches of warm yellow-orange feathers on the sides, wings, and tail. She looked like a fierce rain cloud with the sun peeking through. She had a similar silhouette to a goldfinch but, her twitchy movements caught my eye. American Redstarts are known for their distinctive foraging behavior of flicking their brightly colored tails to stir up insects from foliage. During migration, many warblers stop to rest in dense shrubby habitats where food and water is available. They are excellent bug catchers but may check out your suet, nut or mealworm feeders for a quick bit of extra energy after a long flight. Keep your eyes peeled for the first babies of the season at the feeders. 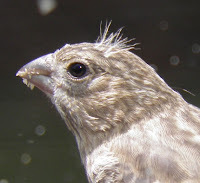 Yesterday I had a family of House Finches at the feeders. Daddy was eating the No-mess birdseed blend and the babies were looking on and begging for food. They were out of luck. Daddy told them their begging days were over and it was time for them to eat like big birds. Some baby birds look exactly like the parents but you can still tell they are babies by their constant fluttering and begging. House Finch young look similar to the females except for the fluffy head plumes that stick up like unwieldy cowlicks on little kids or fuzzy antennae. This nest blew out of a tree, but it was so pretty I thought I'd share a picture.. it actually is prettier in person. Thank you for sharing the photo with us! 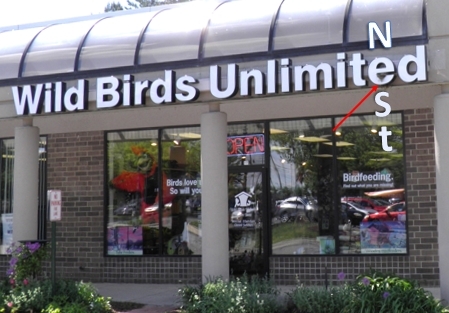 The Wild Birds Unlimited store in East Lansing also has a thing of beauty growing in our front sign. Some House Sparrows have been building a masterpiece. Dolly (cat) has been fascinated with the long pieces of grass they are struggling to carry up to their hom'e'. Nests are structures built, or modified, to provide some security from the hazards of the world outside. They vary enormously among species in their form, size and composition. Although there is enough similarity in nest design for a nest connoisseur to recognize which species built a nest, we do not know how a bird knows what nest shape/size to build. 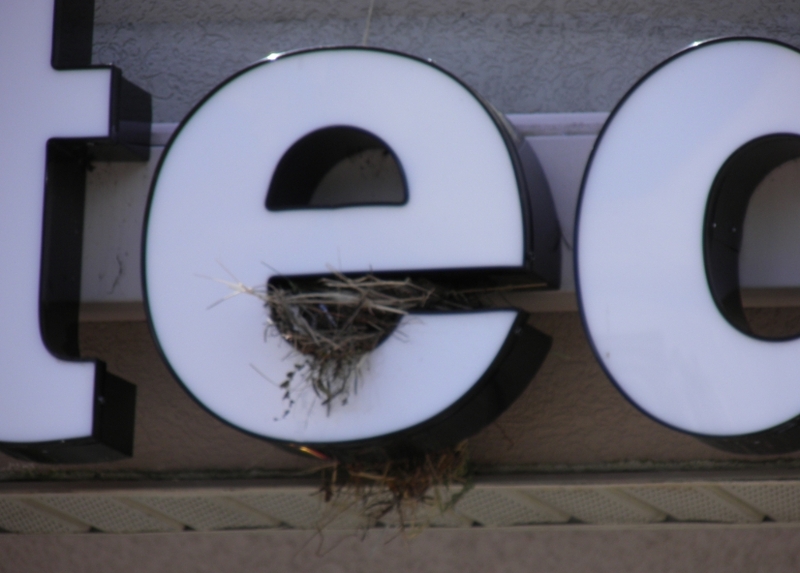 It is possible that a bird comes into the world with a template that provides the basic information as to what a nest should be like and how it should be constructed, but learns during the construction process to improve building performance. 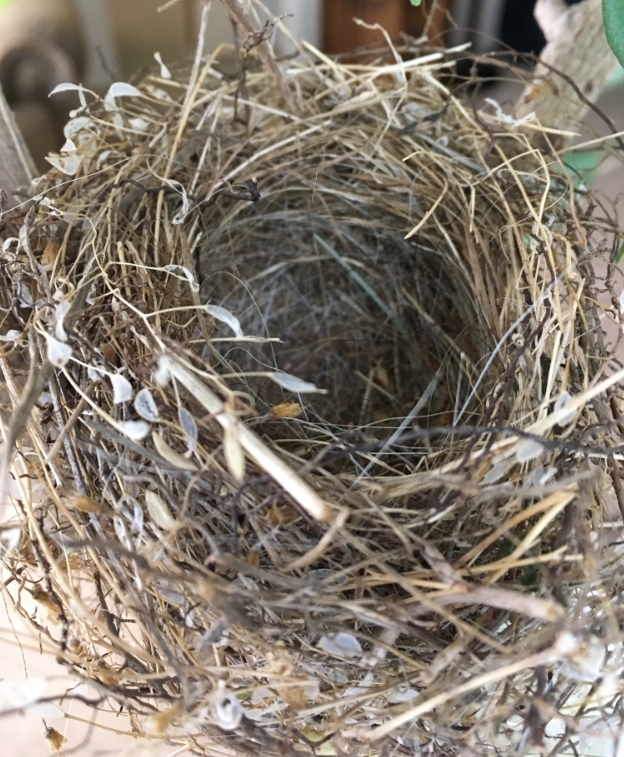 It is not out of the question that birds learn about nest materials and construction while in the nest, so one would expect to see significant similarity between the nests built by parents and offspring. Has anyone mentioned that the goldfinches have stopped coming to the feeders? 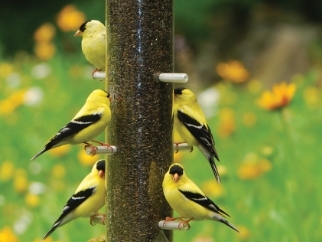 American Goldfinches are common feeder visitors that prefer Nyjer® (thistle) and sunflower seeds. But every year after American Goldfinches have completed their spring molt, a lot of them leave the feeders for awhile and wander widely. Usually when the dandelions bloom, the goldfinches get the urge to forage for fresh, yummy weed, grass, and flower seeds along with tender leaves from trees and other plants. American Goldfinches are the only common feeder bird in Michigan that molt all their feathers twice a year. 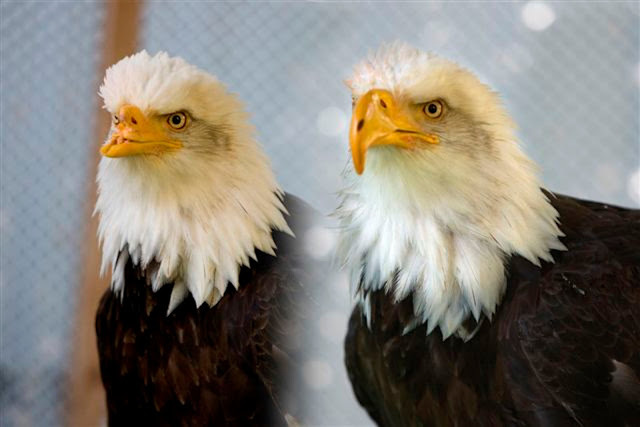 Most birds only go through an annual fall molt. So in early spring the goldfinches are famished. They need a lot of energy to grow bright new feathers and you can be filling feeders daily. As we head into summer the feeder activity decreases. Goldfinches don't nest until late summer. They are footloose and fancy free to forage wherever they want. Some still visit the feeders but not as frequently or in as many numbers. 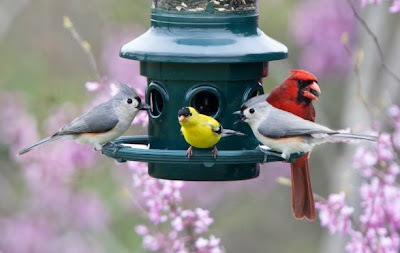 You should still keep the feeders clean and full of fresh seed. Keep in mind that during the summer Nyjer® (thistle) only stays fresh for about a month or two. It keeps longer if it is stored in a cool and dry location. Then at the end of June the activity increases again. As they get ready to nest, there is excitement in the air. The goldfinches settle in to one territory. If your food is still fresh or you have blooming flowers with seed heads, you will likely have goldfinches visiting. And by the end of July the babies will show up too! How do hummingbirds find and figure out a glass bottle full of sugar water is food? Weather is a big factor in how long it takes for hummingbirds to find a feeder. A good, wet spring that produces nectar filled blooms and protein packed bugs means there will be less activity at hummingbird feeders. Drought years are the hardest for the hummingbirds and you will notice instant attraction to feeder feeding as they attempt to find additional reliable food sources. 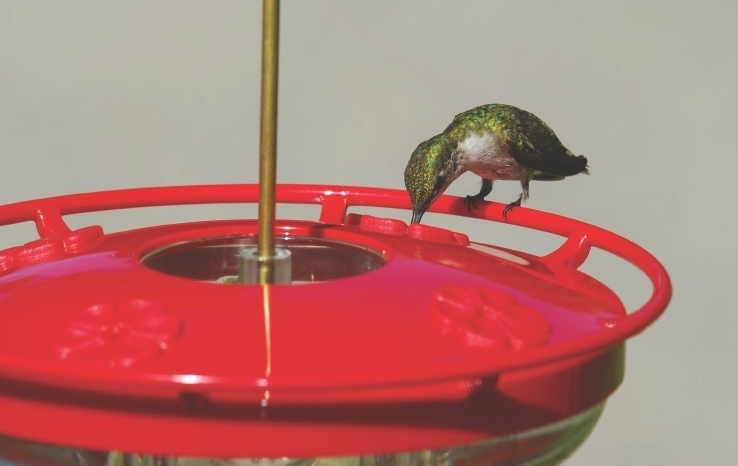 Another factor in determining how long it takes a hummingbird to discover a feeder is if you are in an area that has a lot of feeders. Hummingbirds are amazing birds with many inborn abilities. However looking for feeders is a learned action. They know how to look for the signs of food. The first hummers that came to feeders probably saw bees, ants and other insects investigating a feeder. Those feeders serving yummy food would have had the hummingbirds returning and they would have taught the kids to feed too. Hummingbirds have an outstanding memory. A hummingbird's brain is very large in comparison to their body size. They know every flower in their territory and how long it will take each flower to produce more nectar. And yes that is probably the same hummingbird that comes back year after year to your feeder. They remember where each and every hummingbird feeder is, both at home and along a migration path. Hummingbirds have been observed watching older hummingbirds to learn some tricks and tips. They also learn which people are the ones responsible for filling hummingbird feeders, and which ones don't. At the end of summer I watch the bumbling baby hummers jump from flower to flower, feeder to feeder, red chair to red hat, as they learn how to forage. 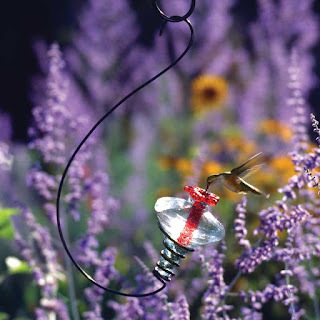 Hummingbirds find food by sight so hang the feeder where they will be able to see it as they fly over your yard. Also a feeder may be found sooner if hung near a flower garden or hanging flower basket. If you put up a new feeder, be patient. It may be an instant hit or it may take them awhile to figure it out. But always keep the feeder clean and the nectar fresh even if you see no activity. In late summer it gets hot and invariably momma and babies will visit along with migrating birds as they bulk up to fly south. 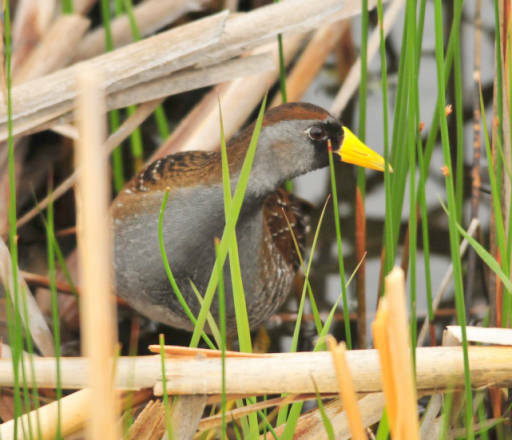 The Sora is a small and secretive bird that prefers wetlands. Their distinctive descending whinny call is commonly heard, but actually seeing the little marsh-walker is much more difficult. Just as people have diverse dining preferences, wild birds also have different food tastes. 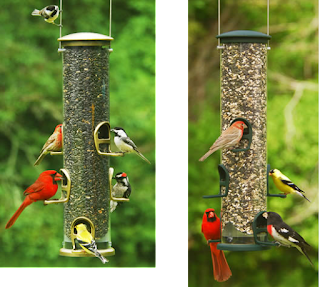 These preferences can be indulged to attract the greatest variety of birds to your backyards. When choosing a seed blend to feed wild birds I always make sure sunflower is the first ingredient. 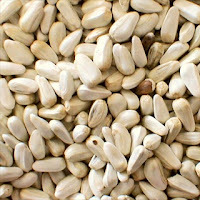 I also like seed blends with nuts. Sunflower seed is the favorite of most seed eating birds like finches and cardinals while the peanuts will attract bug eating birds like chickadees, wrens, jays and woodpeckers. Wild Birds Unlimited East Lansing has a few tons of fresh seed delivered each week and offers several unique blends that are formulated specially for birds in our area. 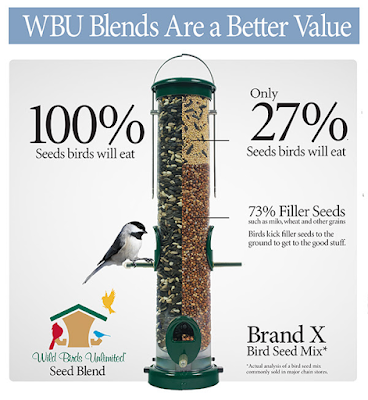 All Wild Birds Unlimited blends are free of Filler Seeds. Filler Seeds like milo, wheat and oats, as well as artificial colors and flavorings are ingredients not preferred by most birds and are generally, left uneaten and found in a pile on the ground. These fillers add bulk to the bag and lower the price, but they are undesired by the birds, and leftover seed on the ground may attract rodents. 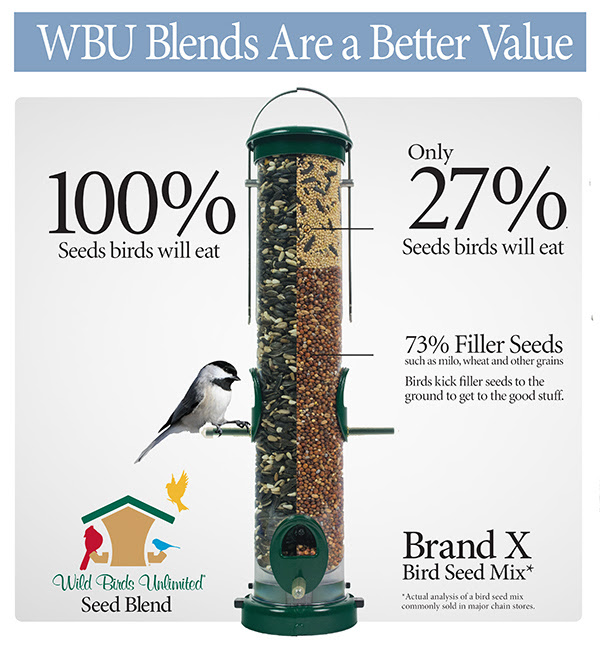 The East Lansing Wild Birds Unlimited customers’ preference by far is the unique No-Mess Blend which contains sunflower seeds and peanut pieces without the shells. No shells on the seeds make for a tidier feeding area, since there's nothing on the ground to clean up. Pound for pound, our No-Mess Blend offers the best value because you do not pay for the shells. The birds eat everything happily. Or if squirrels drive you nuts or blackbirds and starlings crowd your feeder, you might try the safflower solution. Safflower is a small, white, bitter seed that is high in protein and fat. Many favorite backyard birds - including cardinals, chickadees, finches, doves, woodpeckers, titmice and nuthatches- savor safflower. Blackbirds, starlings, and squirrels typically refuse to eat safflower seed. 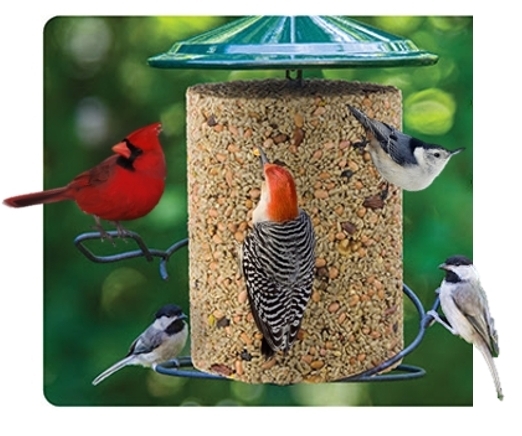 By offering your birds Wild Birds Unlimited seed, you are providing the highest quality calories and making sure that every penny that you spend is going towards feeding the hungry friends outside your windows. There are always debates (sometimes in the same household) should I or shouldn’t I feed the birds in the spring. I love to feed the birds year-round. And each year I am rewarded by catching glimpses of new birds that show up exhausted and hungry from migration. While some warblers are still on their way to Michigan, this year I’ve already had kinglets, thrushes, grosbeaks, buntings, orioles, wrens and many more visiting. Some are just making emergency pit stops where they can grab a quick bite and a little rest before continuing north. Others make homes in or near my yard visiting occasionally and bringing babies up later on in the season! Spring is a stressful time for the birds as they stake out territories, find mates, and raise families. I like to give them a little assistance. In return I get a yard full of beautiful birdsong, a rainbow of colors flying through the air and natural bug eaters patrolling the lawn. The average backyard can be visited regularly by 15 to 20 different bird species. Offering a good seed, suet, mealworms, nectar and fruit as well as water is the best way to see a large variety of birds. 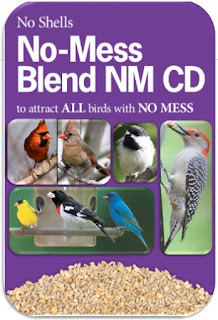 Wild Birds Unlimited offers several unique bird foods that are formulated specially for birds in our area, and all are free of cereal fillers and preservatives. 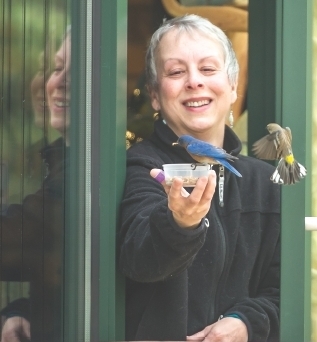 Bird feeding allows us to learn more about how birds behave, interact and raise their young. It is also an easy way to get our children outside, teach them about nature, and show them a way to focus on our world of green, not on a screen. Bird feeding gives us all a chance to create havens in our yard that contributes to preserving wildlife.